Danny Dawson is synonymous with curling in Prince Rupert. The Grade 7 teacher at Prince Rupert Middle School (PRMS) can be found at the rink nearly as often as in his classroom. Whether he’s participating in league play, teaching kids how to play or bringing his class down to the rink for a phys-ed day, Dawson is all about passing on his love of the not-so-popular-anymore winter sport. His journey to become a fixture at the Prince Rupert Curling Club (PRCC) started back in 2003. His wife had picked up curling and after watching her have fun, he decided to join. 12 years later, he hasn’t regretted that decision. “It’s intensely competitive and just a lot of fun. The people are fantastic and you just have a lot of opportunity to do bonspiels, travel and it’s just a fun sport all around,” said Dawson shortly after finishing up a session with the junior curlers on a Sunday afternoon. Dawson has been with his team for for the last five or six years, and they’re a close group. Together, they have won several D events at various bonspiels and even the B event. But the premiere A win still eludes him. Still, he’s proud of what his team has accomplished. “Winning a B event is excellent. Anyone who is winning an event is curling quite well,” he said. They travel to two bonspiels in Terrace during the season and play in a few of their own, as well as compete in the Wednesday night league at PRCC. One of the challenges Dawson has worked through as a curler is an understanding of the sport. “The challenge is to understand the game from the skip’s perspective and understanding how to throw a rock, understanding how hard you need to throw a rock to remove it but not necessarily too far. It took years for me to understand how hard to throw a particular shot,” he said. It’s something he still struggles with from time to time, but he has gotten much better since he started. Curling is all about learning weight and power, he said. 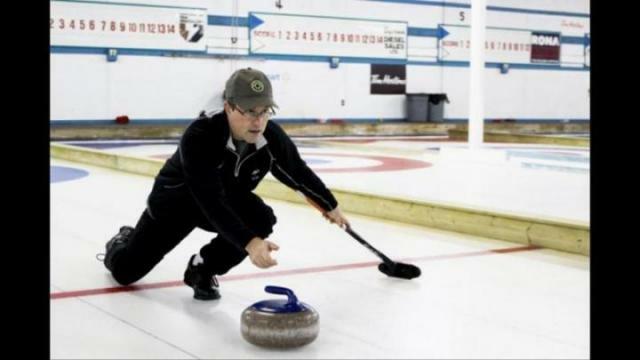 The Rupert local has played many other sports in his life, including golf, basketball, badminton and squash but curling became his top sport. He loves that it depends on a team. “It’s not just you, it’s not a singular sport. In other sports like golf or badminton, it’s just you but being part of a team is nice,” said Dawson. One of his favourite moments as a curler came during a bonspiel around five years ago. Dawson smiled as he reminisced about one of his most proud moments. “I had to go through a tiny little port and roll to the button. I was able to actually call the shot, hit it through the hole, hit a rock out of play and then roll mine to the button for a win. That was definitely one of my highlights,” he said. Dawson’s involvement with PRCC is three-fold. He’s one of the coaches with the junior curling program, he conducts physical education classes at the rink as part of the club’s elementary school program and he’s also a key element of the adult curling league. He has been teaching junior curlers how to play the sport for the last six to eight years. It’s a good opportunity for them to see alternative sports. “It’s basically just to provide an avenue for the kids to try something out of the ordinary,” he said. The program has been fairly successful in the past. Some of the kids competed in the B.C. Winter games a few years ago. Then on Thursdays, Dawson and others at the club host learn to curl nights for adults. It’s a drop-in session that accepts payment by donation, which goes to the junior curling program. The idea is to give adults new to the sport a chance to learn the sport in a non-game format rather than throwing them straight into league play. It’s a fairly new program that Dawson helped start last year. They ran about eight to 10 nights last year and Dawson said it’s been relatively well-attended. The elementary school program is something Dawson runs because he is both a teacher and a curler and the rink isn’t used during the day. His goal is to introduce his classes into different sports as best as he can. “I’ll have all the kids down for a morning and I’ll run them through lessons and then by the end of a morning, they’re pretty close to being ready for a mini game,” said Dawson. He has been a teacher at PRMS for five years and he has brought every class down to the rink. Slowly but surely, he is acclimating Rupert’s youth to a sport that’s not mainstream and is declining in popularity. Whether it’s passing on his knowledge of the sport or playing for his own enjoyment, the curling rink is a happy place for him. “I always see a brand new challenge every time I face a new shot. I’m a competitive kind of person and this is just the sort of game that brings it out. It’s a challenge, it’s a lot of fun and who can’t have passion when that’s involved,” he said.